/// Mader International Pty Ltd is the exclusive Tasmanian dealer for Ricon Mobility Devices and Unwin Safety Systems. Ricon are recognized as a world leader in the manufacture and supply of chair-lifters for all types of vehicles. Their products are designed to work seamlessly with Unwin safety systems, providing a functional and safe method of transporting people with disabilities. Parking systems allow you to reverse or park your vehicle easily and safely while alerting you of objects behind your vehicle. Distance Indicating sensors advise you of accurate distance between your vehicle and the nearest object by displaying on a monitor. A Video Camera installed at the rear of the vehicle and connected to a colour LCD monitor can assist whilst reversing or parking your vehicle. 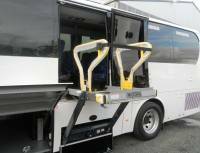 Mader International provide vehicle modifications that assist the disabled or elderly in allowing ease of access, seat relocation, hand control conversions and securing systems for wheelchairs and luggage. Hand controls are connected to the brake and accelerator pedals of an automatic car, allowing a disabled driver (with good hand function) to drive.